As the feasts of joy arrived, Mother gave thanks to Father who gave us the forgiveness of sins on the Day of Atonement and promised us the Holy Spirit of the latter rain, and prayed that all of us may become holy and alert, being clothed with Christ, and fulfill the mission as the workers of the new covenant. At the time of the Exodus, Moses, who received the Ten Commandments a second time and came down from Mount Sinai on the tenth day of the seventh month by the sacred calendar (Day of Atonement), declared God’s will to build the tabernacle. The Israelites, who were moved by the grace of God who forgave their sins, brought the materials plentifully for the tabernacle for seven days from the fifteenth day of the seventh month by the sacred calendar. A feast to celebrate this history is the Feast of Tabernacles. In the New Testament times, this feast was fulfilled by the Preaching Week that is to gather God’s people represented as the trees and materials for the temple. 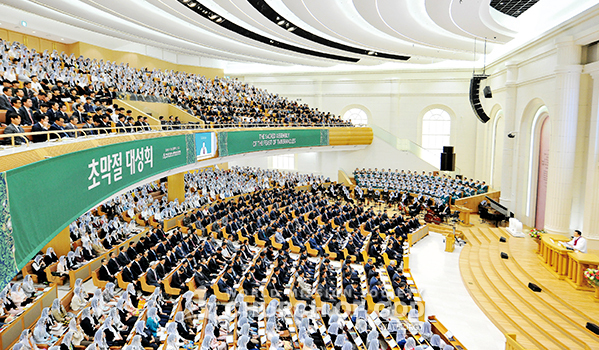 “As people gathered the materials for the tabernacle at the time of Moses, God has given us the opportunity to have the Preaching Week of the Feast of Tabernacles to bring God’s children represented as the materials for the heavenly temple,” General Pastor Kim Joo-cheol explained. “God has commanded us to preach the gospel in Samaria and to the ends of the earth. It cannot be done by man’s power, but can be done by the power of the Holy Spirit. Armed with the mighty power of God, let us lead seven billion people to salvation,” he said emphatically (Lev 23:33–43; Ex 35:4–25; Jer 5:14; Rev 3:12; Mt 28:18–20). Starting from the Feast of Tabernacles, the Preaching Week continued for seven days. Including Korea where Christ Ahnsahnghong restored the new covenant, the Church of God members across the globe preached the gospel of the new covenant to their families, friends, co-workers, and neighbors, and kept pace with the prophecy of the Feast of Tabernacles. 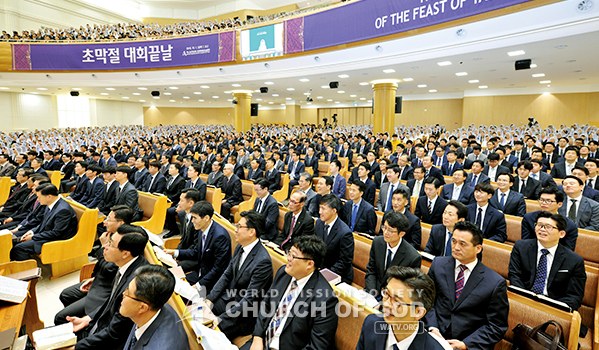 On October 1, the Last Day of the Feast of Tabernacles, General Pastor Kim Joo-cheol implanted conviction in the minds of brothers and sisters through his sermon during the morning service: “The condition of receiving the Holy Spirit in this age is not only to believe in God the Father but also to know and believe in Jerusalem Mother who is the Bride of the Spirit and the reality of the Most Holy Place. Just as the apostles followed Jesus who said, ‘Receive the Holy Spirit,’ two thousand years ago, and achieved a great work of preaching even to Europe, we can join in the amazing work of giving life to mankind when we follow Father and Mother who say, ‘Come and take the water of life’ ” (Rev 22:17; Jn 20:19–22; Rev 21:9–16; Gal 4:26; Eze 47:1–12). During the afternoon service, Mother let us realize that the Holy Spirit has been bestowed upon all the members, and told us the mission given to those who have received the Holy Spirit. Mother was saddened to hear that disasters such as earthquakes and typhoons were happening all over the world recently. “The errand Father asked us is to save the souls who are in pain and agony due to disasters. Obeying the words of God is the truth and the way to the kingdom of heaven,” said Mother. “God surely carries out what He has said and purposed. Since He planned the redemption work of thousands of years and has accomplished it through the sacrifice of His first and second coming, let us keep in step with the prophecies so that all mankind can receive salvation through the water of life. Please make efforts to carry out the Holy Spirit Movement,” Mother asked the members. At the end of the sermon, Mother quoted from The Visitors from the Angelic World: “The heavenly children will be clothed with the robe of glory, together with the spirits of righteous men made perfect. They will live forever with Christ in the angelic world, visiting every star in the whole universe.” Giving us the hope for heaven, Mother earnestly wanted all of us to complete the mission to preach to seven billion people and become the protagonists of the prophecies (Isa 45:22–23; 46:10–11; Lk 12:54–56; Isa 60:1–15; Zec 8:20–23; 1 Th 4:16–17).